How Can I Tell if Email Is Really From Facebook? Every few days I get something from Facebook in my inbox. Or is it? Is there some way to know for sure that email messages are actually from Facebook? With increasingly sophisticated phishing attacks and other spam, it’s completely understandable that you would be skeptical of email that purports to be from Facebook. On any given day, I get email from banks and a number of big Web sites, all generally telling me that there is some sort of security problem and that I need to log in or otherwise verify my account information. Sure, sure, but it’s smart to be highly skeptical. One thing to remember is that services like Facebook will never ask you for your password, but a scammer who sets up a fake site that looks just like Facebook? You can easily be fooled. Tap on “Settings & Privacy” to proceed and it’ll expand downward to show some options. 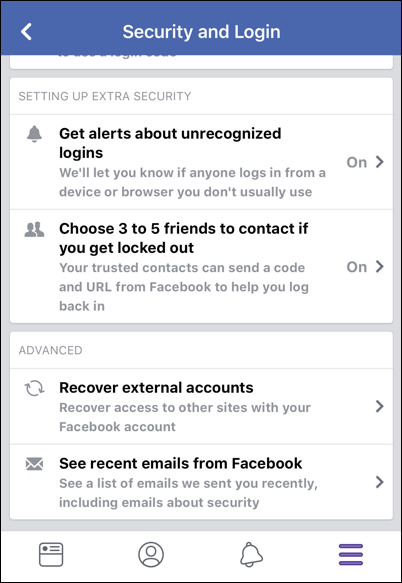 First off, worth pointing out that this is where you find the Code Generator, which can often end up being part of logging in to your Facebook account on desktop computer systems. That’s not what we seek right now, however. Tap on “Settings” to proceed. 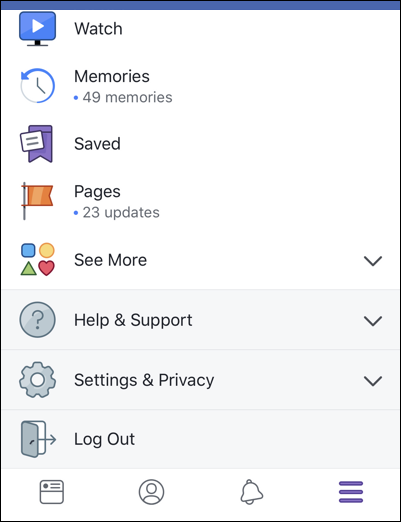 Further down the rabbit hole – because while Facebook makes it possible for you to find a list of email messages, it doesn’t make it easy to get to ’em from the mobile app. So… tap on “Security and Login“. Even though you could swear you did that just a screen or two ago. It’s just, um, deja vu. You’re getting close, believe it or not! In fact, almost there. Before you proceed, though, give a quick eyeball to the list of devices where you are logged in. if you don’t recognize one or more of them, time to ratchet up the security and at a minimum change your password. Can you see it there on the bottom? Finally. “See recent emails from Facebook“. Notice the dates of things too: My most recent email related to security from Facebook was on Sept 28, almost a month ago. So if I were have gotten an email yesterday ostensibly from Facebook, well, it’s clear that it would be bogus. Oh! And do tap on “Other Emails” to see if you have anything there. I generally have nothing in that area. The reality is that you’re wise to be skeptical about any email you get, whether it’s from a big organization or a little online service. Any smart online service at this point should be minimizing its use of email anyway, and if it does send email, that should just instruction you to log in as usual and check your messages from the network or service! Pro Tip: There’s lots to be skeptical about in the online world. I have lots of helpful articles on computer basics that might be worth reviewing to help you stay safe online. I also have a popular Facebook page you should check out too. After all, what better place to learn about Facebook than on the AskDaveTaylor Facebook page?